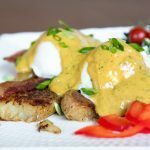 Holiday-worthy gluten-free version of eggs Benedict, you’ll want to have a Smashed Potato Bacon Benny with Creamy Fenugreek Sauce every damn day. Cook potatoes (roast, boil, or 6-7 minute in an Instant Pot) until fork-tender. Cook bacon in a large frying pan to desired crispiness, then put aside. Put potatoes in the frying pan with bacon fat, ghee, or coconut oil. Press down on each potato, “smashing” them flat with a fork or spatula to approximately 3/4″ thickness. Season with salt. Cook each side for 3-5 min on Med to Med-High until golden brown with crispy edges. Poach 4 eggs to your desired doneness. Put 4-6 potatoes on each plate. Lay 2-3 strips of bacon on top, then 2 eggs, and spoon on Creamy Curry Fenugreek Sauce. Serve with salad, sliced sweet peppers, or fruit.